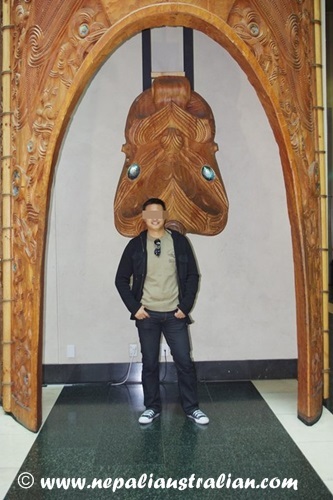 As I mentioned before, I was excited and scared going to Nepal. Not for anything else but just for Chhori as she is so young and I wasn’t sure if she would be OK or not. But on the flight from KL to Kathmandu, I didn’t feel any anxiety or confusion. I was just happy to go to Nepal and meet our friends and family. 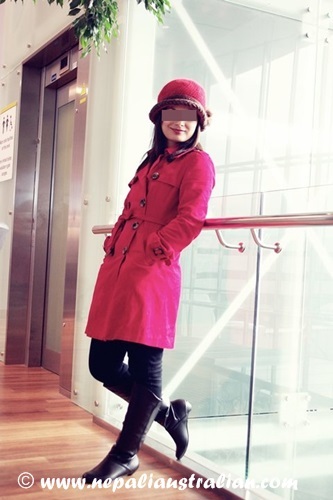 The flight was a short one, only 4 hours and Chhori handled it well. 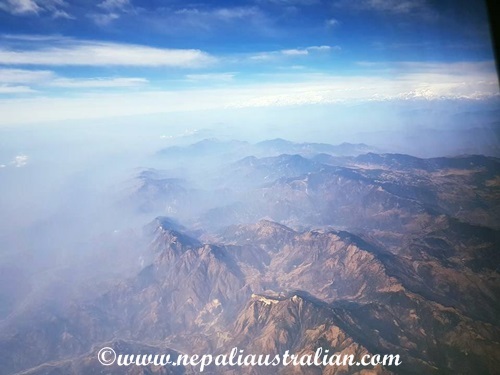 It was a really nice feeling to see the Himalayan range and the beautiful landscape from the plane window as we got closer to Kathmandu. I knew Chhori wouldn’t understand much but I was happily explaining to her that we were going to birth place of her parents. As we landed, cleared immigration and took a lift to ground level of airport, we were welcomed by a chaotic scene with so many people that it was hard to walk around. Apparently, 10 different flights had landed at that time in Kathmandu and as they were only 3 luggage carousel everyone was confused and running around looking for their luggage. I was so thankful that AS and my dad were with us and looking for our luggage while I had to look after a very curious toddler trying to touch everything and anything. Finally we found our luggage and made our way outside. AS’s brothers were there to pick us up and we were happy to be away from all the chaos. 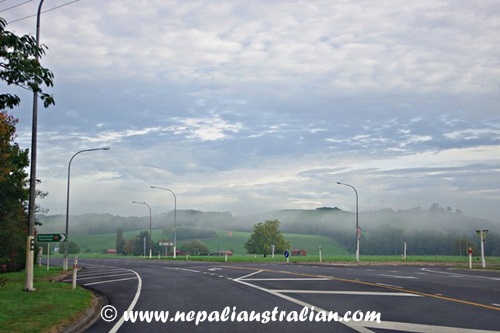 Every time I return to Kathmandu I see so many changes and it was the same this time too. All the roads and buildings bring back so many memories. Chhori was having the time of her life in the car as there was no car seat and she could move around. She was meeting with her Kaka (uncle) and kaki (aunt) and cousins for the first time. My FIL and MIL were very happy to see Chhori after a year. It was so nice to see the grandparents – grandkids relationship. 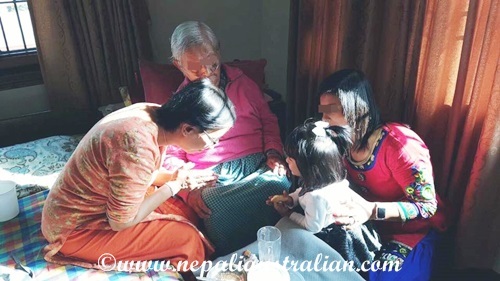 In next few days, we went and met other relatives including AS’s grandma and my grandma who are great grandmas for Chhori. I am so happy that she got to meet them. The sad thing to see was that they have aged so much in the last 3 years and that their health had deteriorated a lot. We did have a great time with all our relatives and I was happy Chhori was having an amazing time with them. 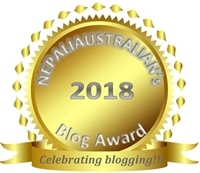 I am going to write more about our Nepal trip soon in another post. Till then, take care everyone. 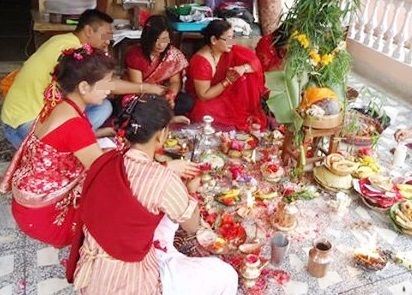 In Nepal, for any big auspicious occasion, people perform a Satyanarayan puja. My mum had planned it to be done a week before the wedding. Lord Satyanarayana is another form of Lord Vishnu. The Lord Vishnu in this form is considered an embodiment of truth (Satya). Satyanarayan is worshipped at home with family and friends by reciting the miraculous story of Lord Satyanarayan. 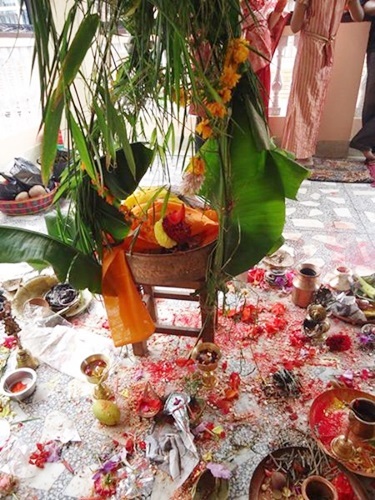 This puja is performed before big events like weddings to bless everyone and to keep evil away so there is no problem during the important occasions. We had a priest come to our place early in the morning and my mum and aunties made all the preparation. 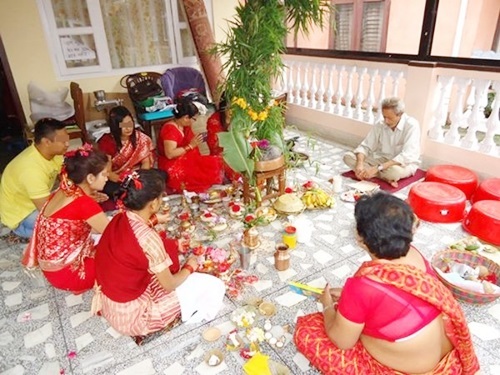 On this auspicious day, we had lots of relatives come over to be in the puja. On the day of the puja, the devotee has to fast and it was going to be my mum, my SIL, me and a few of my cousins. I also asked AS to fast with us. Generally, men don’t do the fasting but but AS was nice enough to be supportive and be in puja with us and fast with us. The priest organised all the things for puja and asked us to do certain things from time to time. Here are the details of what you need for the puja and the procedure. A book on the Puja (in consultation with a Brahmin), a square platform (Chaurang), mango leaves, two new cloth pieces, kalasha, lord’s idol or a photograph, turmeric, kumkum, panchamrut, six coconuts, prasad, four oil lamps, sandal paste, incense sticks, betel leaves, two garlands, areca nuts, turmeric pods, dry dates or almonds, camphor, offerings in form of cash or coins, tulsi leaves and flowers. The puja consists of five parts. The first one deals with the timing of the vrat and the procedure. The other four parts describe stories of the greatness of the God. 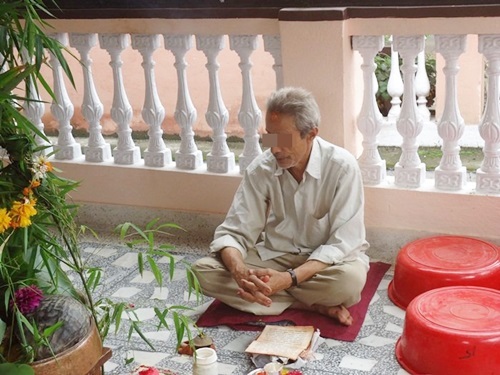 The stories convince the importance of the puja. 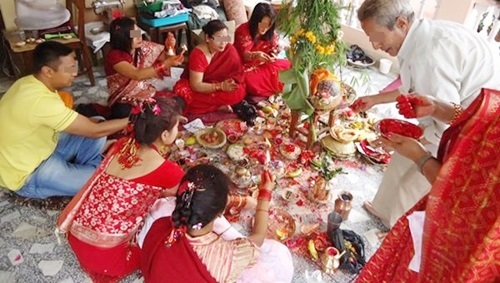 On the day of the puja, it is required to fast and perform the puja in the evening. In a clean room, a new clean cloth is spread on an elevated platform (Chaurang) and rice-grains, about a kilo are spread on it, in the centre. A kalash (Copper pot) capped with a new cloth piece is placed and a small idol of the Lord Vishnu is positioned on it. The puja begins with the lighting of the lamp and praying to the God Ganesha, Lakshmi, Dikpaalakaas, Vishnu, Lord Shiva and Parvathi, Sun, the nine planets and Lord Indra. Lord Ganesha and Panchaloka Paalakaas should be positioned to the north of the Kalash and can be worshipped through areca nuts or almonds or turmeric pods or dry dates. Then, the nine planets should be worshipped by placing areca nuts on betel leaves followed by Lord Indra and other Dikpaalakaas. Later the Lord Satyanarayana‘s idol or image on betel leaf should be worshipped by Panchamrut (a mixture of ghee, milk, sugar, honey and curds) abhishek (sprinkle). At the end of the puja, there is udvaasana, a formal way of concluding the puja. After the puja, we all had lunch and rested for a while. That day I didn’t stress much but enjoyed being at home with everyone and staying positive that our wedding would go smoothly and would be good. 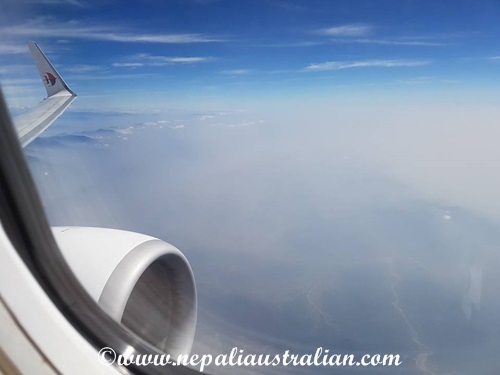 Once I landed in Nepal, time seemed to just fly and I didn’t realise that it was almost the time AS was going to be in Kathmandu. In the two weeks, I finally found a flower guy who was going to decorate the venue and provide flowers. He was charging me heaps but I was ok as long as he provided what I wanted. I also had a meeting with the photographer and was pleased to see his works. He seemed to have a modern outlook with an understanding attitude. I had a very bad experience with the photographer during the engagement so I wanted to make sure that this time we had some nice photos. After negotiating the price I had finally selected the videographer and photographer. The venue was already finalised by my dad and I was happy as it was near our place and very spacious. The most important thing was still in limbo, my outfits for the wedding and it’s not that I needed to pick just one dress; I needed 7 outfits in total for different functions. 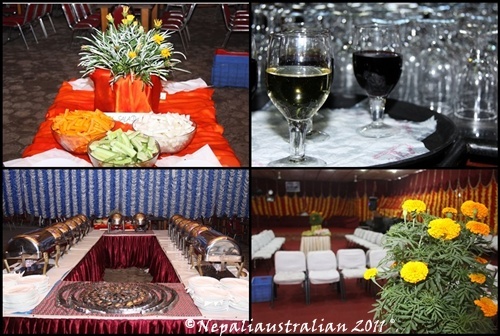 As you may already know in most of the Asian weddings there are different functions and a newari wedding is not any different. My mum had already bought me one outfit, a red duppta sari and my mother in law had got one for me as well. But for the rest of the functions, I needed to decide what I wanted and to buy them. I have options to go boutique but most of them are super expensive for good one or to buy readymade ones off the shelves. In the middle of this crazy preparation, I also needed to go shopping with my MIL as she wanted me to choose the bag, shoes and other stuff that she was going to give me. It was really thoughtful of her so one afternoon, we went shopping and I choose a few shoes, hand bags, and accessories. 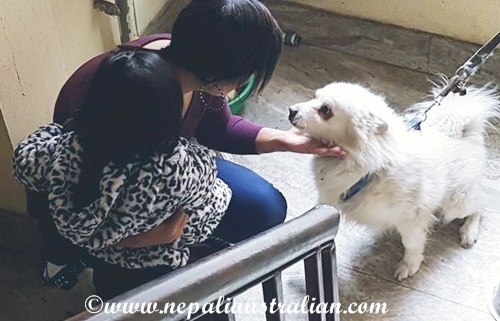 AS arrived in Kathmandu and it was so nice to see him again after two weeks. I went with his brother to pick him up from the airport. We had a short time together before they drop me off at my parents’ house and he went to his own parents’ house. From that day, we had 2 weeks for the wedding. Luckily, when I was talking to one of my friends, she introduced to me to a beauty parlour for my hair and make-up. The last thing to do was buy a few saris and a lehenga for the reception. One afternoon I was determined to finish my shopping so I went with my cousin and bought a lehnga and a few saris. I just didn’t want to think about the outfits anymore as there were so many other things to be organised. I also booked for someone to come to our place for our mehendhi ceremony and sort out other details. By then I had one week left for the wedding. 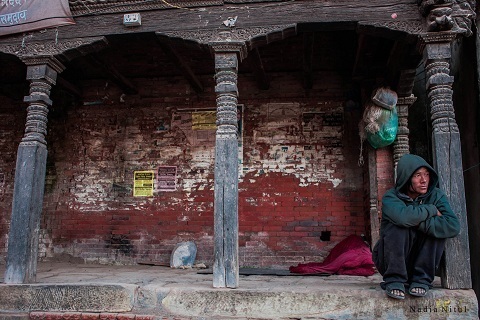 Once AS was in Kathmandu, it was easier for me as I could always ask him to accompany me. We went to order the cakes together. No one was willing to do a cake as per our design. On top of that, there weren’t any nice toppers like we wanted available with them. So we went to handicraft shops and finally found two different toppers for the two cakes. 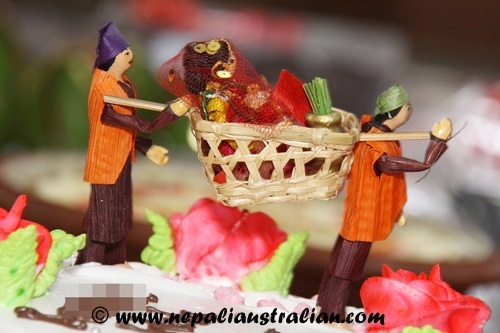 One topper was of a bride carried in olden style basket and the other was of a bride and groom. 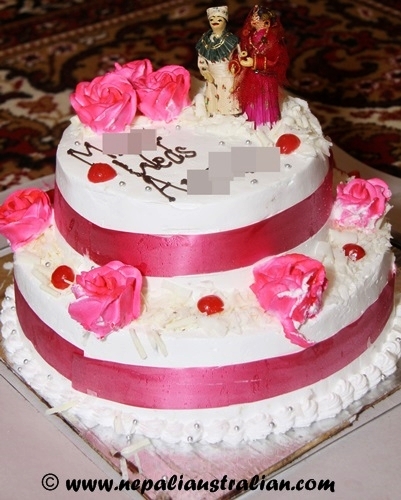 We loved both of it but again it was hard finding a baker willing to do a cake as we wanted with our toppers. Finally, one bakery agreed and we placed our order. We were not sure of the outcome at that point but had no other choice but to trust them. Later when the cakes were delivered, we were over the moon as they did a great job. In the mean time I also made 200 packets of Masala (a Sagun bag with lots of dried fruits and nuts) to be given to the Janti. During that time, it was hard for me to sleep at nights as my mind raced 100 miles an hour thinking of what else needed to be done for the wedding. I never realised that wedding planning was going to be such a tough job but it was. Most nights I slept late and woke up early but things were being done and it was a relief. Every morning I was on the phone and every afternoon running around doing errands. 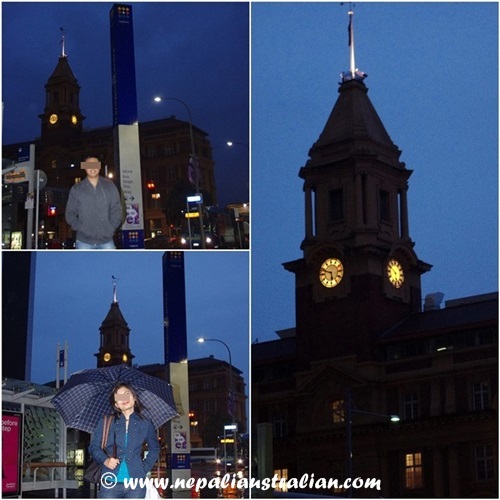 It was such a hectic two weeks for me and on top of that as it was monsoon in Nepal the rain didn’t help at all. More on the wedding in the next post. 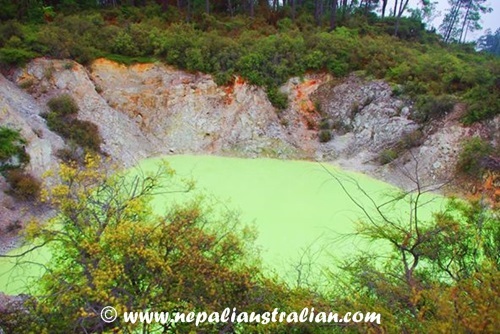 Once we got back from our New Zealand holiday, we had only a few months left before we were to fly to Kathmandu for our big day. The plan was for me to go before AS as he didn’t have many days of leaves. I needed to go ahead and help my parents plan the big day. During the few months remaining the date of the wedding changed a few times which meant that we need to change out tickets accordingly. I was really annoyed by that but there was nothing we could do from here. 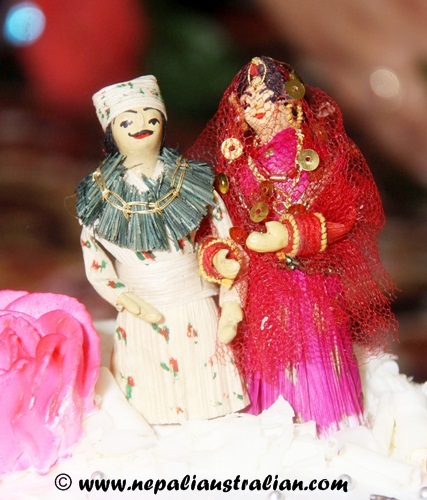 Finally the “Sait” (auspicious time for wedding ceremony) was finalised and according to that the other functions of the wedding were finalised as well. Both our families were busy booking the venues for the functions and receptions. 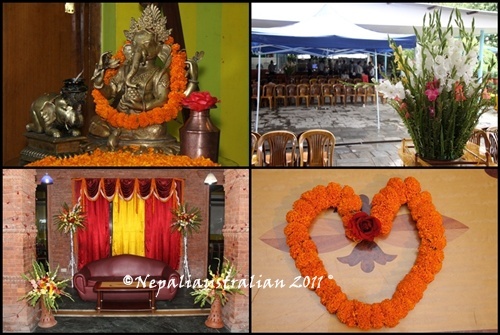 As most of you already know weddings in Nepal are not a small affair and ours was not going to be small either. Every time we Skyped with our family, they would update us with the progress. Sometimes I felt so helpless listening to them as they were doing so many things and there was not much we could do from here. From my end, I was trying to organise the photographer and wedding cakes. 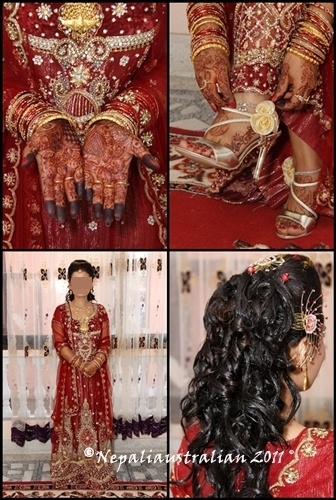 I also wanted to find a place to buy my bridal outfits and a palour to do my hair and make-up. 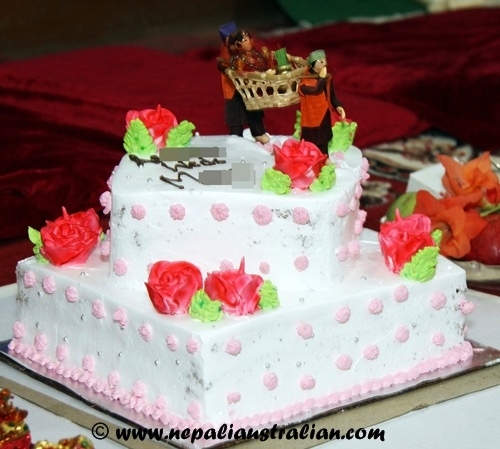 I think Nepal is one of the worst places to have a wedding if you are trying to find any information online. There are hardly any websites that provide the services and on top of that if you find any and email them, they don’t reply to your queries. 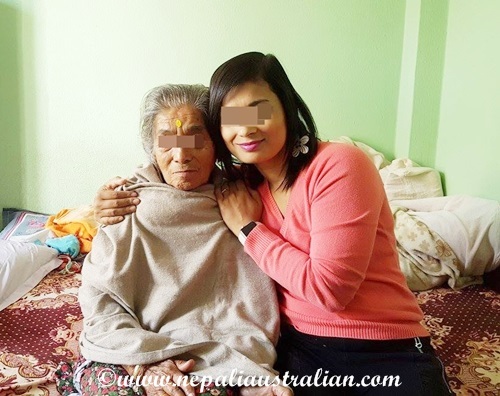 During this time I so wished I had a sister in Nepal who could go around and help me. I felt so lonely and desperate by the end of the process. I was tired, frustrated and annoyed that nothing could be sorted out via the internet. I had to wait until I was in Kathmandu to do everything and I would have only a few weeks before the actual wedding when I got there. Finally, I got hold of one photographer who seemed good, nothing about the cake was done and my outfits were nowhere near selected. I had a long list of things that needed to be done and most of them were not possible from Sydney. I used to get so annoyed every day but AS was always there to calm me down. With AS it was easy, he decided that he will wear “daura sural” one day and suits the rest. The only thing he needed to do was give an order for these few suits and everything was sorted for him. With work keeping me sane and busy, it was finally the day of my flight to Nepal. I was excited and scared at the same time. AS dropped me to the airport and we said goodbye for 2 weeks. I was praying on the flight that the wedding would go as planned and there would not be any unexpected problems. I really wished someone in Nepal was free so I could get some helping hand with my preparations. With my mum busy with her job and dad on his business, I was not sure I would be able to manage the list and execute a wedding. The flight to Kathmandu was fine though long but I was really glad to see my parents at the airport when they came to pick me. I was just glad that I was home and I promised myself that no matter how the wedding was going to go, I would have fun and it would be our special time and nothing should ruin the experience. Imagine me doing a happy dance while writing this post. Yes, we have booked another trip. It is not going to be a long trip but still we will be going away for few days to beautiful New Zealand. Next week , this time I will be in the plane going towards my destination. 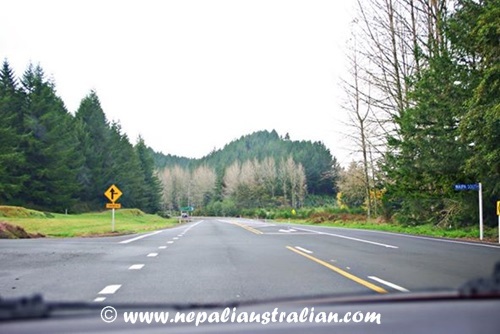 If you have been reading my posts, I had written about our North Island trip. This time we will be going to South Island. I have been there before and it is really, really beautiful and I can’t wait to enjoy the place with AS. New Zealand is known for its many landscapes, you can be at the beach, the snow, the mountains or the city in a short space of time. You can hop in a car, drive for an hour or two, and feel like you are on a completely different planet. It is the start of spring in New Zealand right now so it should be perfect to experience some snow if we are lucky. We will be going around Queenstown and driving along absolutely, breathtakingly, stunning towns and mountains. Queenstown is the epitome of outdoor offerings, solidifying its status as the extreme sports capital of the world. Something about holiday and me agrees so much that as soon as the planning stage is started, I have this high endorphin rush in my body making everything nice and happy around me. 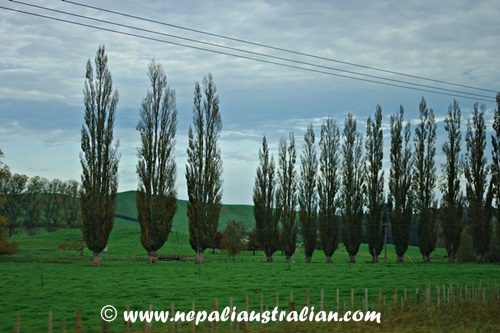 I am already dreaming about the green and picturesque New Zealand :). My head will be filled with new memories and my cameras sure will be very busy capturing the beauty. I love going to New Zealand as it is just 3-4 hours away from Sydney and I am able to surround myself with beautiful things and beautiful people. The country’s landscapes have left an indelible mark on my memory from my past visits and I know this trip will not disappoint me either. 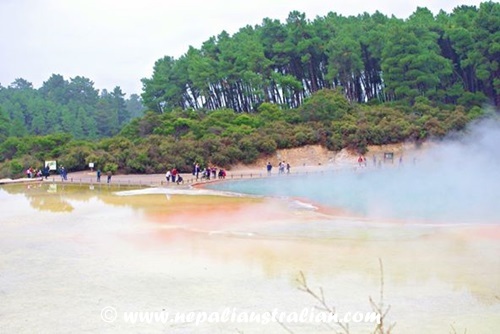 If you have never been to New Zealand, please look at my photos and posts from past visits and I am sure you will want to be there too. 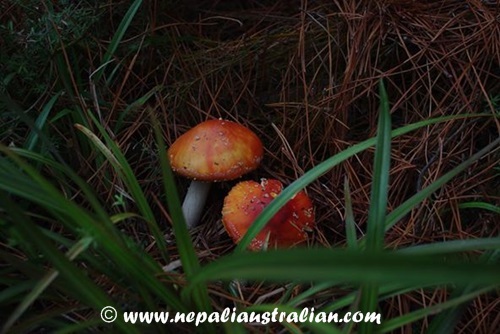 I am sure I will be updating my blog with our new experience once we are back. It’s FRIDAY again so have a great weekend everyone and take care. We spent the last few days of our holiday in Auckland. 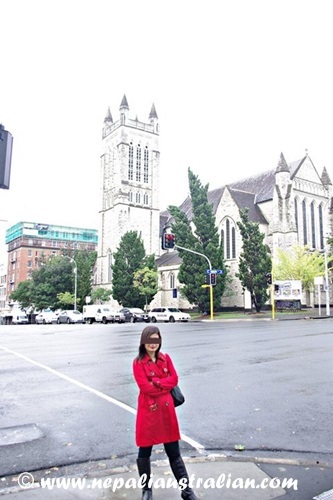 It was autumn but Auckland was still wet. We stayed in the middle of the city and our hotel was nice and close to restaurants and shops. After looking up what to do in Auckland, we made our first stop at One Tree Hill. 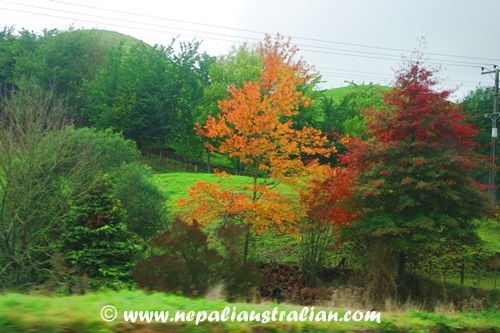 One Tree Hill, also known as Maungakiekie, is a 182 metre volcanic peak. The summit provides views across the Auckland area, and allows visitors to see both of Auckland’s harbours. It was a short drive from our hotel. It was still drizzling when we parked our car but both AS and I were both in the mood to enjoy the day no matter what. 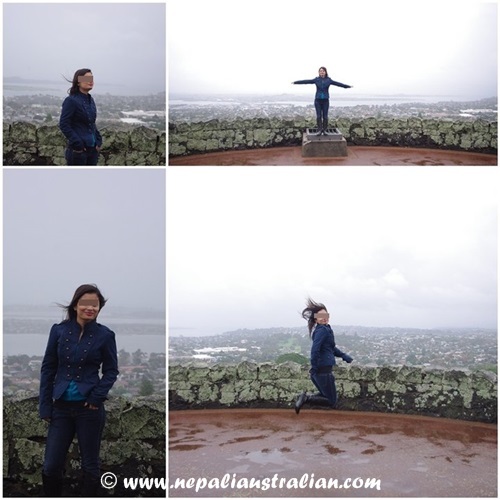 We had brought umbrellas the day before so we were well equipped for the day J.
Steeped in Maori history, this dormant volcanic hill set in the beautiful Cornwall Park was the perfect outer city escape. 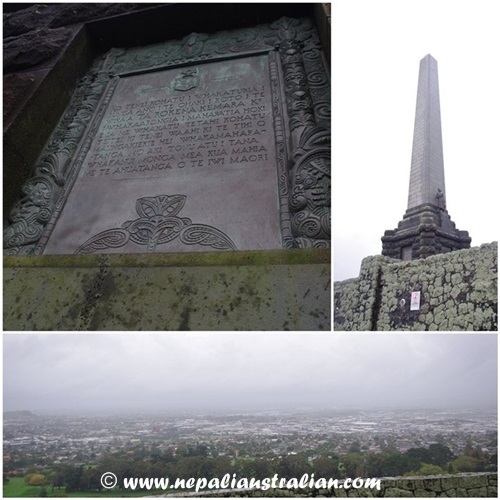 The volcanic cone was the centre point of the Maori occupation during the 18th century, and the obelisk acknowledges its importance as a sacred and special place as it is also the final resting place and grave of Sir John Logan Campbell. We made it to the top of One Tree Hill and joined a few others who were taking photos. After a walk to the summit and when all of the necessary photographic shots had been taken, we decided to simply sit for a few moments. 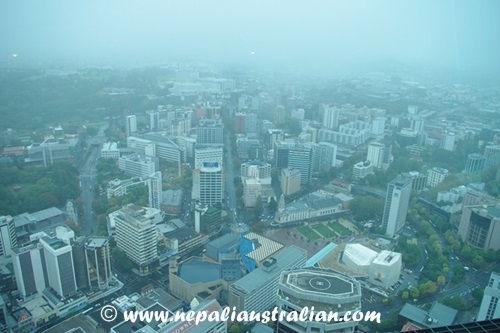 One of the days we decided to go and visit the Auckland sky tower as it was on the top ten places to visit on trip advisor. The Sky Tower Observatory perches at the top, like a doughnut, resting at the top of a giant stick. The doughnut-like shape allows you a 360 degree panoramic view of Auckland and its surroundings. The views are amazing from the viewing platform. There are some glass floor parts and it was just great to stand on it and see the ground far, far feet below. 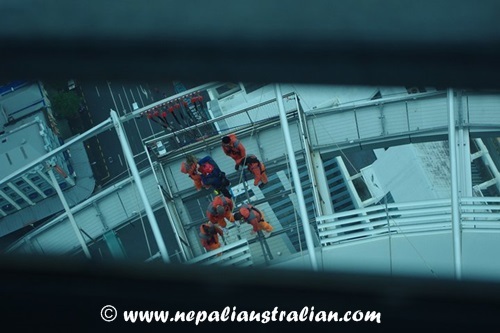 From the top, we saw people doing Sky Jump and were eager to do it as well but we had not booked it in advance. By the look of people doing it, I think it would be a great adventure. One evening went and explored the wharf around Auckland. It was beautiful with many nice restaurants and cafés but it was windy so we didn’t stay long. We were out and about in city a few times. We went shopping and eating at different places and enjoyed our walk. I love the place, which was so multicultural, and reminded me of Sydney a lot. We saw a few churches and bought a few souvenirs. 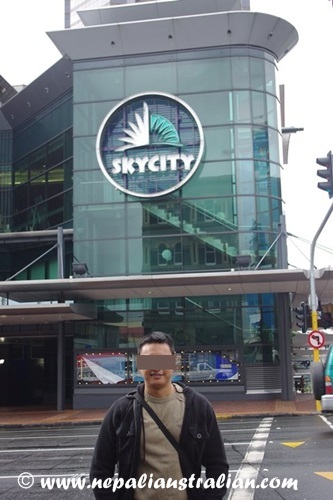 From Auckland, we drove to our car hire company and then to the airport. 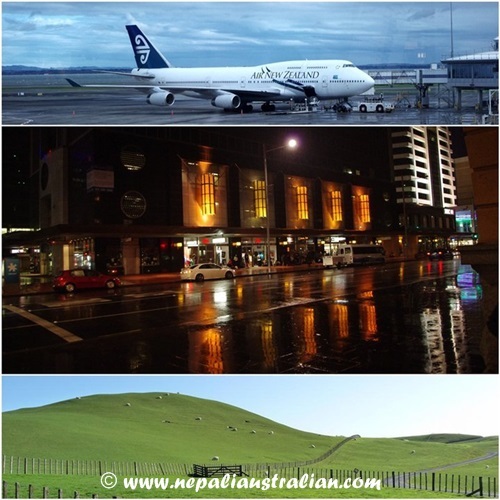 Our exciting holiday came to an end and we left New Zealand with heaps of memories. Take care everyone, more on next post. 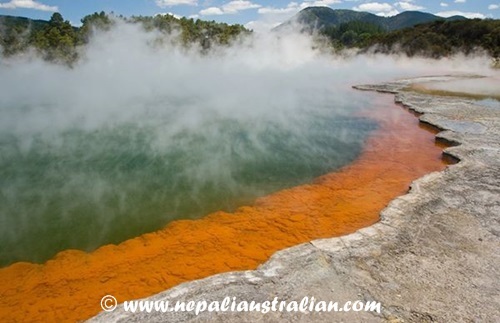 We had booked a hotel at Rotorua and from there we had plans to go around in the rental car. 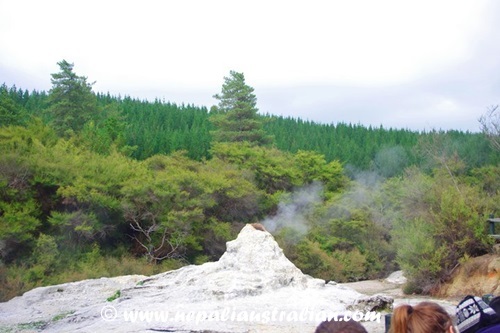 As we were driving towards Rotorua, we could smell the distinct smell. It smelled like rotten eggs and me and AS looked at each other and thought how could we stay in this place for the next 48 hours. Luckily after you are in the area for more than 30 minutes, your nose kind of adjusts and you don’t notice the smell all the time. 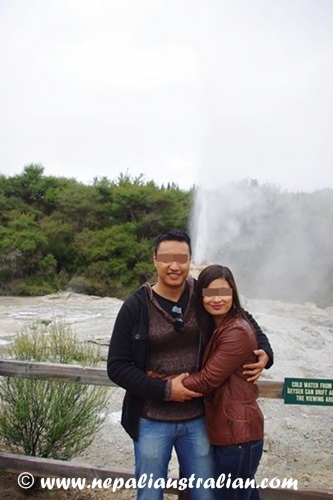 Rotorua stinks because the whole place just reeks of sulphur. 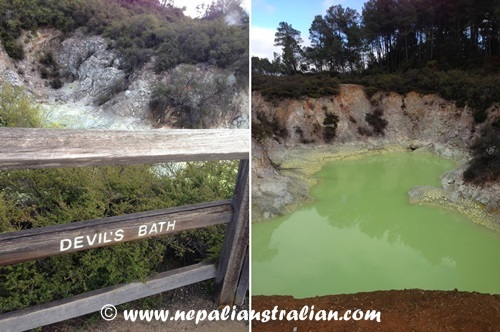 It comes from all the geothermal stuff going on underground, close to the surface. It’s the reason there are so many nifty mud pools and hot springs in town. Once we checked into the hotel. 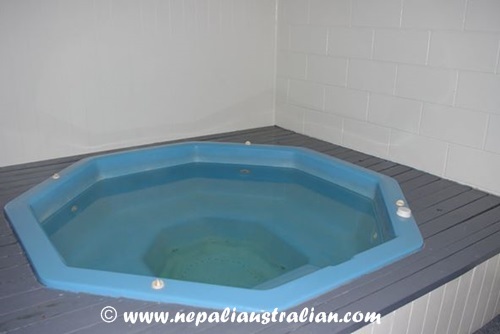 We were glad that we had a big hot tub in the room. We both relaxed on the hot tube and ordered dinner in. We both slept like a baby, as we were very tired. 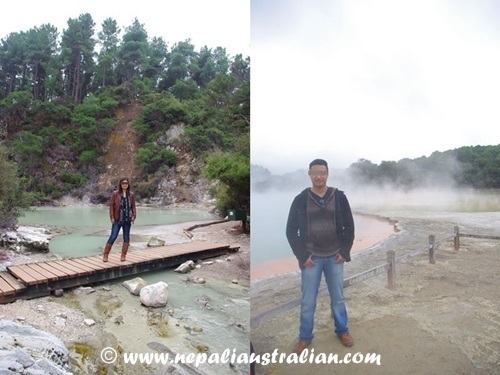 The next day we went to Wai-O-Tapu Thermal Wonderland. 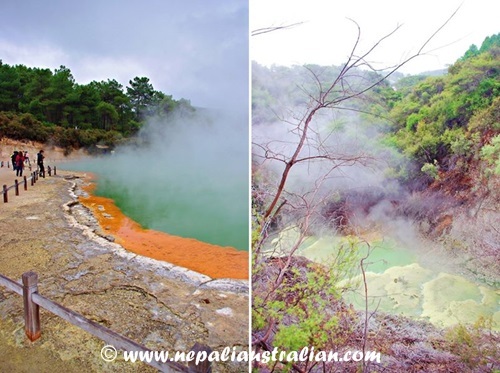 Wai-O-Tapu (sacred waters) is New Zealand’s most colourful and diverse volcanic area, it’s full of stunning geothermal activity and colours of every tint in pools, lakes, craters, steam vents and thermal terraces. 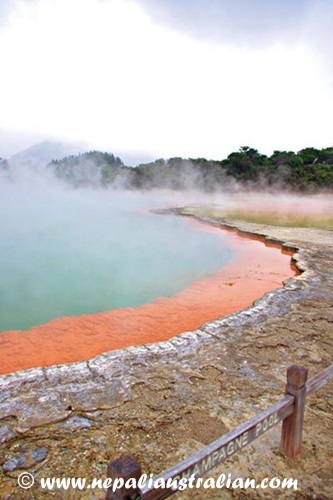 Forming a part of an eighteen sq.km reserve administered by the department of conservation (although Wai-O-Tapu itself is owned by a Maori tribal business group) it has the largest surface area of thermal activity in the local Taupo volcanic zone. 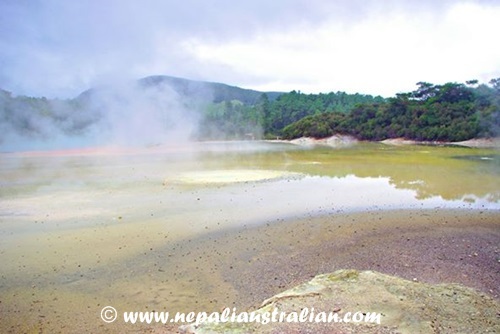 Scattered with collapsed craters, boiling pools of mud and deep hydrothermal springs the reserve provides a wealth of colourful phenomenon to discover. 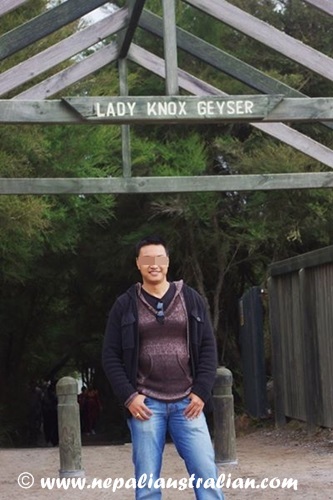 After buying our ticket, first step was lady Knox geyser. Lady Knox geyser was a short drive from the main entrance. We parked and follow the map to the area. A sizable crowd had gathered around the geyser by then. AS and I managed to garb a seat and we had a good view. 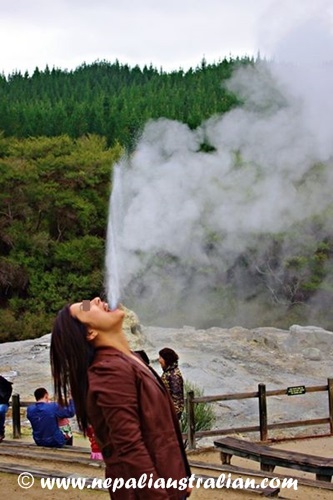 We were eager to see some geyser action. The geyser doesn’t blow up automatically. A staff member comes out, gives a short introduction, and then throws a bag of soap into the geyser. 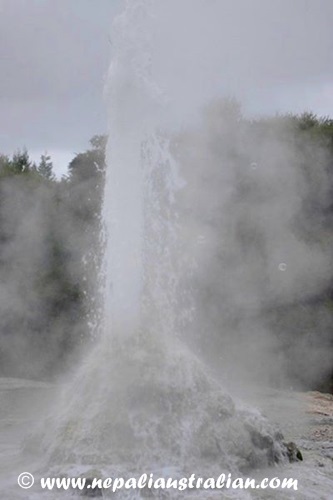 The soap triggers such a massive reaction that the water comes out of the geyser and goes up to 10 m into the air. It was really amazing. After the demo was done, we took a few photos and headed to our next stop. There were three options for us to walk around the place. Walk 1, Walks 1 and 2, Walks 1, 2 & 3. We decided that we would do it all; otherwise we would not be able to see all the sights. The path is very clear. Follow the path. Stray at your own peril. 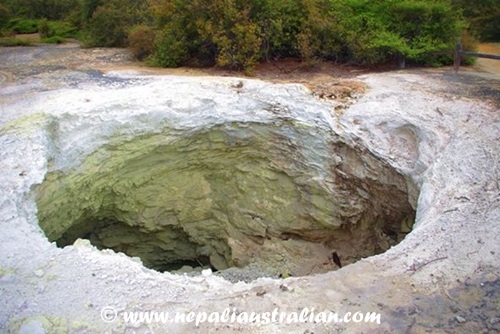 Falling into that hole will surely spoil your holiday. Overall we had a great time and we had some awesome photos for our memory. Take care everyone, more about beautiful New Zealand on next post.